* Water-borne metal effect paint for interior use. * Suitable on various substrates and applications. * Preferably apply by spraying. 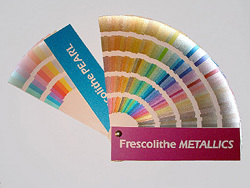 * Colours: 235 (see Frescolithe Metallics/Pearl colour fan).